On November 8th, Chinese President Hu Jintao will step down from his posts atop the Communist Party and Chinese government after exactly 10 years in power. If one word could sum up Hu’s presidency, it would be stability. In policy and in character Hu has remained ever-wary of deviating from a steady, low-key approach to leadership. He lacks the cultish devotion enjoyed by Mao Zedong and Deng Xiaoping, and the charisma of his predecessor Jiang Zemin. Hu’s approach has seen a near quadrupling of per-capita income in China, but little in the way of political reform. Earlier this year, Hu’s comparatively liberal faction of the Communist Party seemingly won a victory with the fall of left-wing icon Bo Xilai. Hu has tended to keep Mao Zedong’s legacy and the more socialist tendencies of the Party at arm’s length. But he still pays homage to the ideology that the communist government was founded on. However, “Socialism with Chinese Characteristics” – perhaps more accurately known as authoritarian capitalism – has seen major side-effects come along with economic growth. Foremost among them is official corruption. Under a system that bars deep scrutiny of leaders through media or free speech, Hu has repeatedly pleaded with party members to keep themselves clean. “Leading cadres at all levels should always maintain a spirit of moral character and be aware of the temptations of power, money and beautiful women.” April, 2010 in keynote speech wrapping up campaign aimed at educating officials. Reigning in the excesses of economic development was the theme of Hu’s signature “Harmonious Society” socio-economic doctrine, which aimed to make Chinese society more balanced and just. However, wealth inequality has soared under Hu to its highest levels in PRC history. Another worry of the Hu administration has been that foreign culture and ideology may be usurping the domestic agenda. On several occasions he’s called for China to promote its own values and push for greater soft power at home and abroad through “cultural reform.” Earlier this year he wrote a strongly-worded essay on the issue, which was critically received by many foreign observers. As the commander-in-chief of the world’s largest military, Hu has increased China’s defense budget by double-digits nearly every year he’s been in charge. Some have speculated that this is simply to keep the guardians of China’s authoritarian rule happy. Others have worried this may be part of a greater effort to exert military influence in Asia and enforce claims over long-disputed territories. For the entirety of PRC history, the most significant territorial conflict for China has been Taiwan. When the pro-mainland KMT candidate Ma Ying-jeou became president of the island, Hu redirected cross-straits relations from a course of tense provocation to one of engagement. Much to the consternation of hawks within the Communist Party and army, Hu opened more economic and people-to-people exchanges with Taiwan. The move tacitly took a military-enforced re-unification off the table for the foreseeable future. 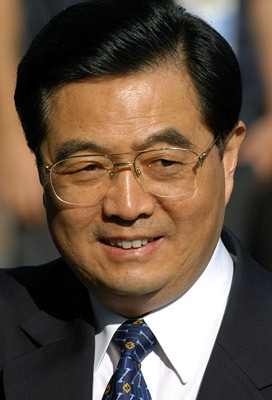 “I sincerely hope that our two parties (KMT and CCP) can work together to continue to promote the peaceful and steady development of cross-strait relations, and make efforts for the bright future of the Chinese nation,” –Congratulatory remarks to Ma Ying-jeou on his election as chairman of the Kuomintang , July, 2005. Beyond his professional life, little is known about Hu as a person. His image is meticulously crafted as a tireless servant of the people who devotes his life to conducting field inspections, speaking with peasants and meeting with foreign diplomats. A leaked US embassy cable from 2009 opened a window into the choreographed world of Hu by recounting how a seemingly spontaneous chat with a rural farmer was actually planned days in advance – with the farmer being told not to shave so as to appear more rustic. Under a heavily controlled media, going off-script is rare and details about leaders’ personal lives are scant. A journalist was once even fired for revealing that Hu is diabetic. Skeptical audiences mocked the obviously-scripted conversation, asking where they too could find such unbelievably cheap housing.